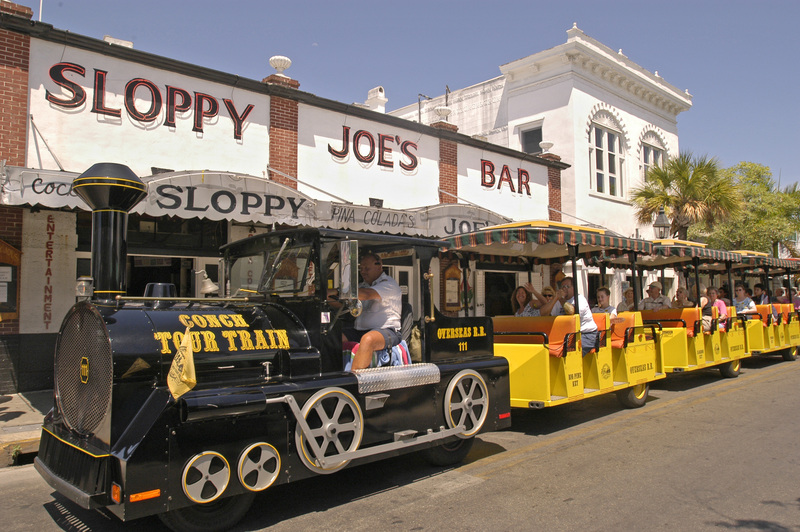 Visitors in Key West, Fla., ride the Conch Tour Train as it passes in front of Sloppy Joe’s Bar, former watering hole of author Ernest Hemingway. The faux train and Old Town Trolley are two of the island’s primary motorized tour operations. Key West is the southernmost city in the continental United States. Photo by Bob Krist/Florida Keys News Bureau[/caption]The landmark “Southernmost point in the continental United States” is one of the most photographed tourist hot spots in all of Florida—and it’s right in the heart of Key West. This is where the Caribbean meets America, with a blend of old island charm and modern elegance. From its high-end luxury seaside resorts to the grown-up playground of Duval Street, Key West is the tropical paradise of the contiguous 48-states. appealing to so many people, it is easy to see why Key West claims to be “Close to Perfect and Far from Normal.” It may be the most unique town in America.